We are trying to get over colds and soup is just the ticket. We load a base broth with antioxidants and vegetables to help us to recovery. You may also like to try my Soothing Soup recipe for a classic chicken stock and noodle based soup, or the Ham and Bean Lentil and Vegetable Soup for a richer warm combination of protein and greens. 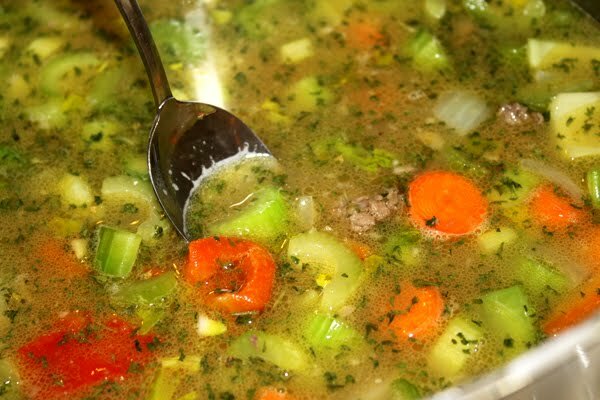 This soup is simple and it is a great way to use left overs from a meal that incorporates either steak or pasture raised ground beef. Combine all ingredients and heat. Serve warm with crisp vegetables if that is your preference, or cook over medium heat for a longer time to soften vegetables. I like to add a splash of salsa and hot sauce to this soup. If you are able to eat dairy, you may enjoy some shredded cheese at serving. We love soups over here. They are a great one dish meal that incorporates vegetables. Grains are not required. They freeze well and reheat well. Enjoy and stay healthy! This soup is gluten free, dairy free, soy free, and safe for those using the specific carbohydrate diet plan.